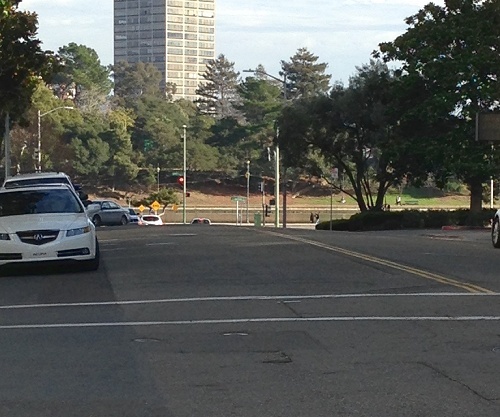 Oakland’s ice age features are subtle and easily overlooked. I’m here to help you see them. 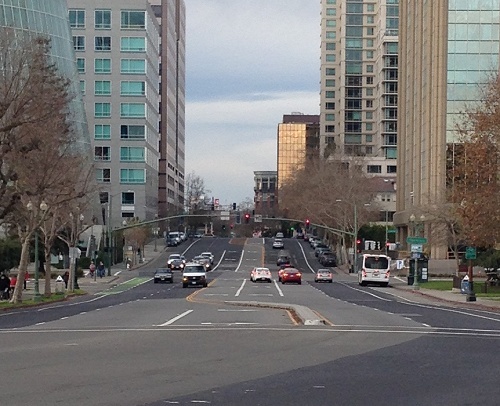 The photo above looks west on Grand Avenue from the tip of Lake Merritt. As you pass Harrison Street heading toward Broadway, you climb a low rise about 20 feet high. That rise is a deposit of sediment that was laid down when the sea was higher than it is today. 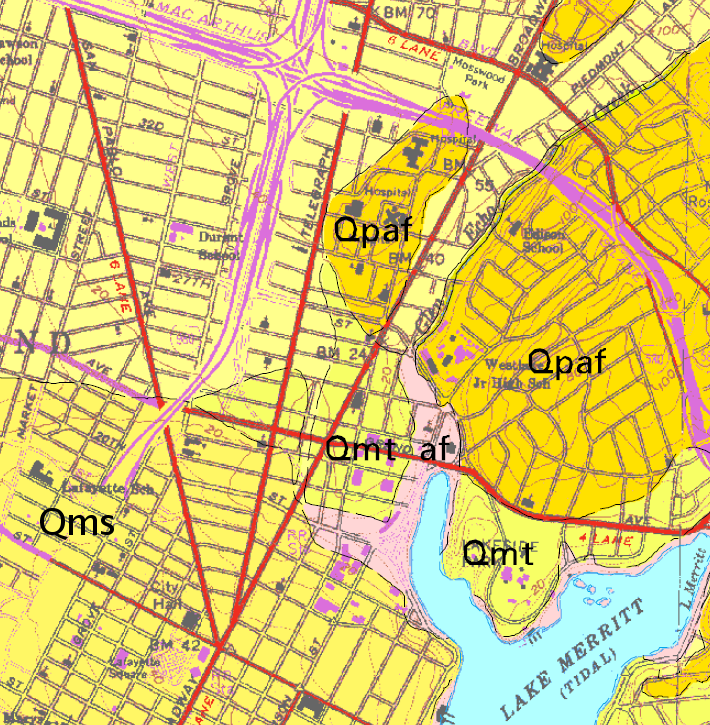 It’s shown on the geologic map below as Qmt, for Quaternary marine terrace. “Quaternary” refers to the age; the Quaternary Period started 2.6 million years ago, when a long series of ice ages began that extends to today, and encompasses the Pleistocene and Holocene epochs. “Marine” says that the feature formed in the ocean. “Terrace” means that it was built upward from the base — it’s a pile of sediment, as opposed to a wave-cut platform, another flat-topped coastal landform. Oakland has three areas of Qmt, the largest being under the old town of Clinton and the second being under Lakeside Park. Those are easier to see than this third area, which I would call the Uptown-Valdez terrace. As you approach the lake on 21st Street, you can see how its elevation matches the terrace across the water in the park. The terrace is a little over 20 feet in elevation here and is very flat. The western edge of the terrace is invisible. 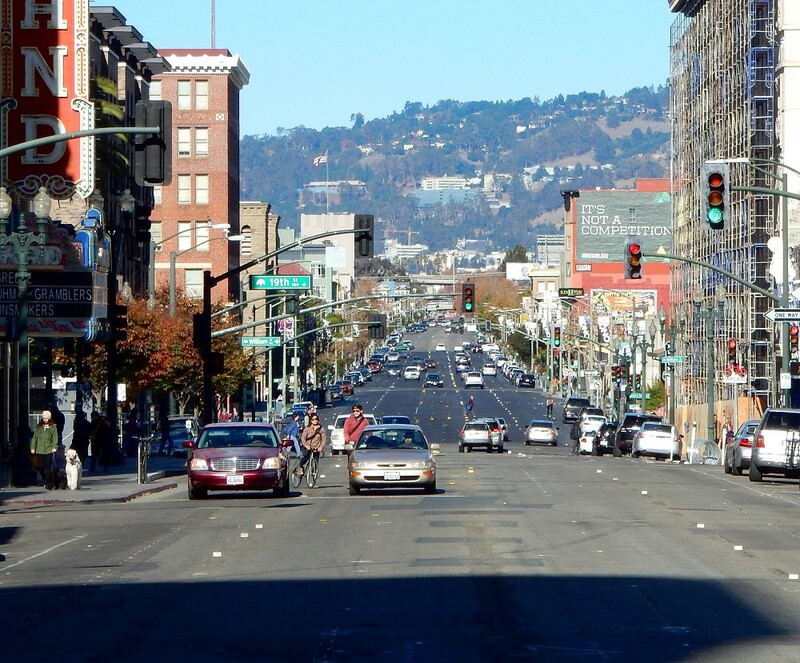 Here’s my best effort to show it, looking up Telegraph Avenue on a clear day with little traffic. View it full size (1000 px) for the best experience. I was standing at 17th Street. The nearest cars are at 18th Street. Behind them the ground slopes down to 20th Street, where the pavement turns fresh. Beyond that, the crosswalk is at West Grand Avenue, and the new pavement ends at 27th Street. Telegraph takes the slightest turn to the right at 30th Street, under the “Qpaf” mark on the geologic map. The freeway crosses just past 35th Street. In all this territory, the elevation changes hardly at all, except in the foreground. That downramp between 18th and 20th is the edge of the Merritt Sand, the ancient dunefield that underlies downtown proper. The creators of the geologic map presumably mapped the marine terrace in this area with the help of engineering reports, well records and the like, because the landscape gives no sign of its presence. This entry was posted on 28 December 2015 at 8:02 am and is filed under Oakland geology views. You can follow any responses to this entry through the RSS 2.0 feed. You can skip to the end and leave a response. Pinging is currently not allowed. Old maps show that an arm of Lake M. used to reach toward San Pablo along 20th, the pink area in the map which must skirt the edge of this QMT rise. The 1857 coastal survey map linked from Gene Anderson’s Nov. 19 post (http://blog.ouroakland.net/) shows it. Thanks for another year of always interesting reading. It must be a lot of work, but it is very much appreciated.